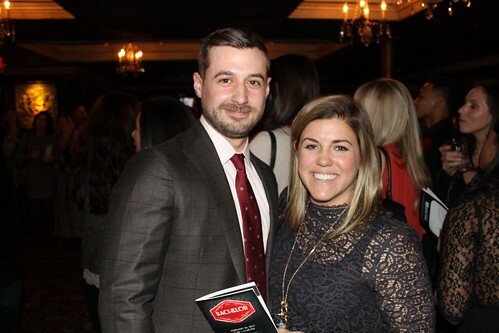 2017 Boston Bachelor Auction Raises Nearly $30,000 - The Junior League of Boston, Inc.
On Friday, February 10, doors opened to a sold-out crowd of 250 people at the Foundation Room in the Boston House of Blues. The live auction kicked off with emcees Ashlee Feldman from JAM’N 945 and Ghandi from Matty in the Morning getting the crowd excited to bid on bachelors and a wide variety of date and experiences offered in the silent auction. Guests looking for love quickly lined up to place their bids on 12 eligible bachelors dressed head to toe in handsome Brooks Brothers suits. The fundraising event raised nearly $30,000 in support of the organization’s ongoing community programs and leadership training. The proceeds from this event will enable JL Boston to continue to serve the women and girls who benefit from the League’s training and community service programs. Thanks to all of the bachelors, sponsors and attendees who came out to support this event!